Rachel Kyte is CEO and Special Representative to the UN Secretary-General for Sustainable Energy for All. Representing 80% of the global economy, what the leading industrialised and emerging economies of the G20 do – individiually and collectively – matters. More than two years into the implementation period of the Sustainable Development Goals (SDGs) and two years past the Paris Climate Agreement, doubling down on energy efficiency is the obvious step in an energy transition that aims to decarbonise the global economy. Despite providing cost-effective savings and environmental and health benefits, energy efficiency efforts among the G20 are lagging. While China, India and Mexico have made ambitious broad changes – and the US and EU countries have made impressive gains in parts of their economies – overall progress is not at the pace needed to double the global rate of energy efficiency improvements by 2030, as called for by the SDGs. More needs to be done to achieve this globally-supported goal that will help end poverty, protect the planet and ensure prosperity for all. Those who work on energy efficiency complain that the contributions it can make to achieve our climate and development goals are often overlooked. But the benefits are real, touching individuals and families across the world. The countries hosting the Presidency of the G20 the past two years – China in 2016 and Germany in 2017 – have rightly placed energy efficiency at the top of their energy agendas. And it is paying off. In 2016, German consumers saved nearly $580 per capita due to home- and vehicle-related efficiency programs. In China, the average household saw a 25% drop in its energy bills due to efficiency efforts, as well a 27% drop in smog pollution for Beijing-area residents. That’s fewer asthma attacks and hospital visits. 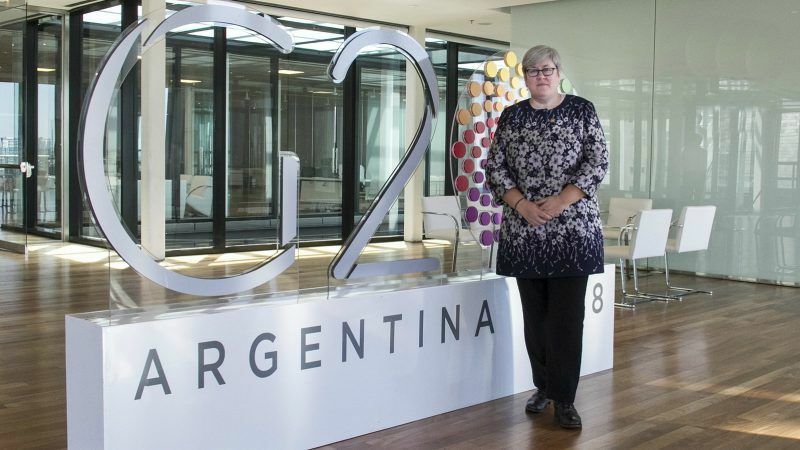 Argentina, which is hosting the G20 Presidency this year, is also seizing the opportunity. It is focusing on energy efficiency standards for social housing, strengthening mandatory efficiency standards for appliances and developing efficiency labels for light-duty vehicles. What would it take to get the entire G20, and its lion share of the global economy, to become an energy efficiency powerhouse? First, G20 countries need to re-size their ambitions to meet the 2.6% annual improvement targets necessary to achieve the 2030 efficiency goal. This means at least tripling and, in some countries, increasing by six-fold their energy efficiency investments. One place to start is by recognizing that within the G20 there are strong efficiency practices—they’re just not everywhere. There is a wide performance gap, with some G20 countries using 80% more energy, on average, to run their economies compared to Denmark, widely viewed to be “best in class” in energy efficiency for an advanced economy. Using positive deviance as a management tool, all G20 countries can set comparable goals and map out steps to achieve them. And the best can set the next benchmark of high performance. Last year’s RISE report, produced by the World Bank and supported by Sustainable Energy for All, highlights the importance of strong efficiency policies and standards in driving improvements. Yet, new data show a noticeable slowdown in implementation of new policies by G20 countries in 2016 and 2017. Second, the G20 needs to strengthen policies at home and support them in other countries. The International Energy Agency (IEA) has shown that more than two-thirds of global energy use is still not covered by efficiency mandates. All countries should be strengthening and expanding policy coverage with mandatory codes and standards. These standards should align with the Paris Climate Agreement and the SDGs. They should provide the conditions for the private sector to innovate the super-efficiency we need now and in the future. Third, energy efficiency has to be on equal footing with other types of energy planning in national policymaking. Conversations about energy security, renewable energy and modernisation must include energy efficiency as a key form of infrastructure. Fourth, energy transition discussions are often overly focused on power generation and not on other uses of energy. The transport sector is on the cusp of its own revolution—burgeoning electric vehicle demand, for example—but in order for efficiency in transportation to allow all people to breathe clean air, commute to work affordably and move goods and services efficiently, we need aggressive, integrated policymaking and engagement, especially from city leaders. Fifth, and on the same theme of uses of energy, heating and cooling technologies must be a focus of robust efficiency goals. Key in this regard is the recent ratification of the Kigali Amendment to the Montreal Protocol. It requires a major phasedown of high-polluting refrigerants (known as HFCs) used in cooling equipment. The importance of cooling to protect food supplies, preserve medicines or simply keep cool in ever-hotter cities and towns cannot be overstated. Getting everyone affordable, super-efficient, HFC-free cooling is an ambition worthy of the G20. Finally, financing energy efficiency has seen little innovation in recent years. Paying companies and their bankers to be more efficient has had its successes, but this model isn’t achieving scale and it doesn’t offer the most efficient use of public funds. It’s time for a rethink. Energy efficiency reform takes time but its impact is immense. Ask Mexican households whose energy bills are less today compared to 30 years ago, even with all the additional services they are getting from energy use today. In racing terms, energy efficiency is a marathon and the G20 is already off the pace. The question is this: Can G20 pick up the pace and, as the best marathoners do, sprint as well? This is the challenge for G20 countries in 2018. They must lead from the front and sprint to win. Sustainable Energy for All is the global platform working to achieve universal access to sustainable energy, as a contribution to a cleaner, just and prosperous world for all. Find out more at www.SEforALL.org.